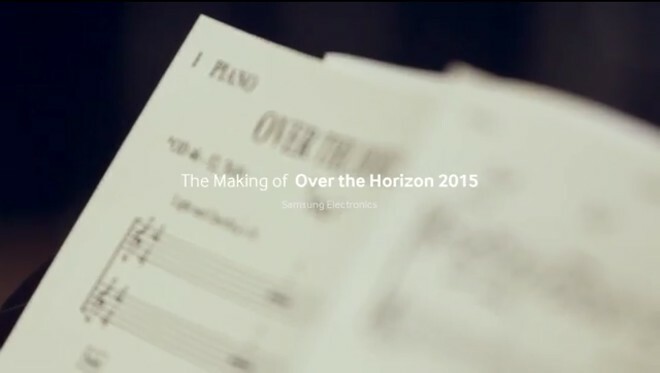 We have no doubt that you have heard the “Over the Horizon” song by Samsung. Actually, it is hard not to, seeing how it has been around for quite some time now as the default ringtone for all of Samsung’s devices and is also featured in its marketing campaigns and frequently played at events. However, chances are that you are only familiar with a couple of version of the said piece and it has gone through a lot of reimagining over the years. Samsung tells the story of how its beautiful theme was transformed yet again, prior to the release of the current flagship duo – the Galaxy S6 and S6 edge. All versions of the song are based on the same six basic notes, enough to make it instantly recognizable, while leaving endless room for variations and ornamentation. The 2015 version of “Over the Horizon” definitely has a feel of its own and it should, considering the Korean giant specifically recomposed the piece to make it slicker and also a tad more relaxed than last year’s version. This is what the company has dubbed most fitting for the spirit of its current device lineup, while still conserving the beautiful classical sound. The latest version of the track was recorded at Ocean Way Studios in Nashville USA, which has done a lot of work for high-profile artists, such as Johnny Cash and Bruce Springsteen. Centerstage at the live performance was a 40-piece orchestra, with the pivotal six piano notes in the end and beginning, entrusted to well-known musician Jamie Christopherson. Mixing and final touches come courtesy of 21-time Grammy Awards winner Al Schmitt. So, the whole thing is definitely world class. Buy, you should really check the touching video for yourself and see how the memorable “Over the Horizon” theme has transcended into 2015.